Migrants walk along a railway track as they cross the Hungarian border with Serbia near a collection point in Roszke, Hungary, Sept. 11, 2015. The United Nations Children’s Fund is calling for urgent action by the European Union to fully protect children fleeing conflict in Syria and other war-torn countries. UNICEF said refugee children are particularly vulnerable and open to abuse and exploitation. The U.N. Children’s Fund found that children made up one-quarter of all asylum seekers in Europe so far this year. In the first six months of 2015, it reported 106,000 children sought asylum in the European Union, most from war-torn Syria, followed by Iraq and Afghanistan. Peter Salama, UNICEF's regional director for the Middle East and North Africa, said that after five years of conflict in Syria, the war is coming to European shores. Speaking on a telephone from New York, he said it is important to remember why Syrians are fleeing their homeland. 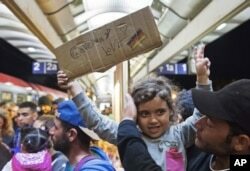 A migrant girl holds a sign expressing her love to Germany as she arrives at the train station in Saalfeld, central Germany, Sept. 5, 2015. Salama said children are being killed and maimed by aerial bombardment. He said boys as young as eight are being forcibly recruited as combat soldiers. Girls are being used as sexual slaves or forced into early marriages. He said Syria is moving toward becoming a failed state and the country’s children risk becoming a lost generation. Given this context, he said it is hardly surprising that people are fleeing to salvage a future for themselves and for their families. Salama said it is critical that European countries provide health care and protection services for the refugees. He said their asylum policies must take children's best interests into account. In the meantime, the U.N. refugee agency welcomes a European Union plan to relocate 160,000 refugees from Greece, Italy and Hungary to other countries in Europe. But, the UNHCR said for the plan to work, reception centers that can quickly register incoming refugees must be set up in the three countries of first asylum.